Besides the required ingredients, I also added the grated rind of one orange. 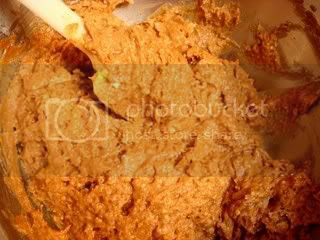 And besides that, I wanted to see how this recipe would come out via the two-stage method (mixing the fat with the flour). What you are looking at there is the sliced cubes of cream cheese mixture and the flour mixture after the butter has been added to it. 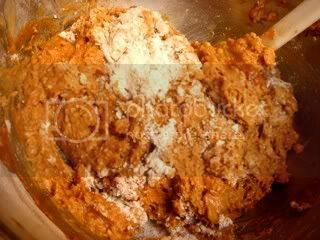 And right here is the dry and wet ingredients mixed together with some flour not thoroughly mixed. At this point, and something I've encountered with this recipe even when followed as per directions stated, the mixture was much too dense and thick. I added about ¼ cup of milk. 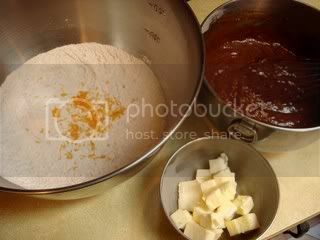 Next time, I'll decrease the flour by ¼-½ cup. The result was still a bit thick, but... wow I'm drawing a blank... but more to the correct consistency for a muffin batter than before. I'm very wary of over-mixing a quick bread. Here are the filled tins, just about a smidgen below the top. 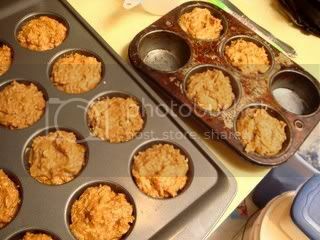 (I recognize that this picture makes it look like the batter is flush with the top of the cups, but it wasn't exactly. It was about a little beneath it, though some may have been right at the top -- I learned that from the Once Upon a Tart cookbook.) The empty tins were filled halfway with water (I swear the steam helps them rise better or something. 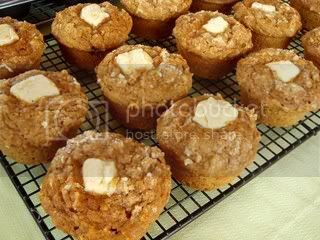 Or something, have any of you noticed that the stature -- yes, I just used an animal/human word to describe my baked goods -- of your muffins decreases after sitting out of the tin post-bakeage, even the next day? Is it due to the moisture in the air? Sometimes it happens after they cool, even when baked long enough so as not to sink in the center). Here you see the topping mixture of the grated rind of one orange to ¼ cup of sugar. 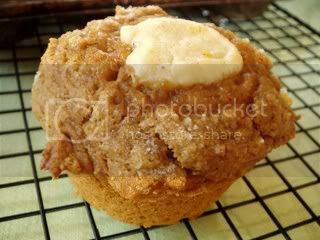 The other picture is a sugar-dusted cream cheese cube-filled cup of pumpkin muffin batter. Don't push the cube in all the way. What you may or may not be able to see from the last picture is that due to the cream cheese cubes being made to cheesecake-esque, it didn't ooze enough to penetrate the entire muffin, though I most certainly got the too-much-oozing-it-looks-mucus-y issue down... Also, I didn't add nearly enough spices resulting in less than an essence of spiciness. Basically, if I hadn't known I put spices in the batter, I wouldn't have even been able to taste it at all. That and it was gummy. Remember how I often speak highly of the quintessential spongy factor, where you are able to press (lightly press, like with the carefulness of Jedi mind-strength that gives enough force to prove your point without being overpowering) down all the way and it pops back up into shape, all the while not having the mouth-feel of a piece of rubber? Sponginess these muffins had not. It made me very depressed, as failed baking excursions are wont to leave me... Next time, I won't add an egg or a tiny bit of flour (I was aiming for a consistency between uber-runny and too set), perhaps adding some milk to thin it out a little (around a tablespoon), increase the spices x4 (I did increase it x2 the first time), and use a wee bit less flour. At least it looked pretty. 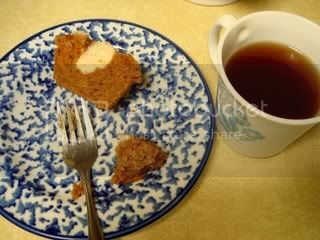 And the tea was nice (it was Nutcracker Spice from Celestial Seasonings). I'd say that I can't always be perfect but it sounds all sorts of wrong. Oh, and I'm not having a pity-me party, I just like discussing every facet of what went awry so as to ingrain it into my brain, "DO NOT REPEAT!" Hang in there... baking is a learning process. 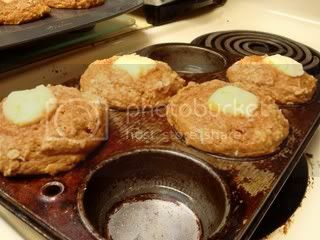 Peabody - Yeah, I usually know better than to change the recipe, but out of curiosity I wanted to see if it would work. Now I know! Nora B. - It is, but it keeps from being a total waste because a) it was still edible and b) as we both said, it looks pretty good! 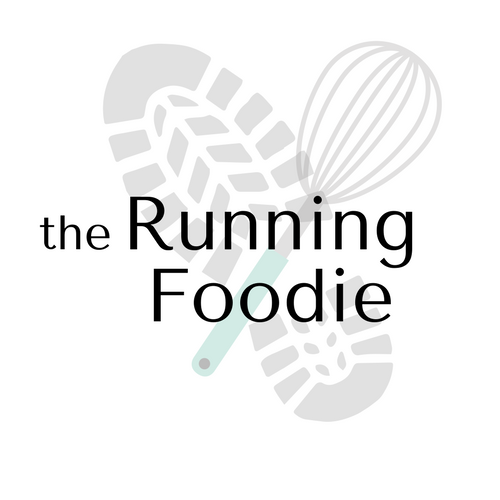 Okay, that last part reminds me of Starbucks' pastries that look good but taste not-so-good! seems delicious. I've never eat this. I have to try this at home.